Those of you who’ve lived in the 80s might have felt as if you were back in that time based on some of the trends I’ve spotted this spring and summer. Pops of neon were visible in clothing and accessories. T-shirts had bright phrases and designs, and many skirts and dresses could have been worn to a Prince concert back in the day. We have not traveled back into the 80s in a hot tub time machine, instead many designers added neon and 80s inspired pieces to their spring 2012 collections. The neon colors remind me of the 80s and also remind me of my highlighter collection. I decided not to purchase any super bright pieces this summer. I feel like some of the looks are more appropriate for those who are in their 20s and younger. 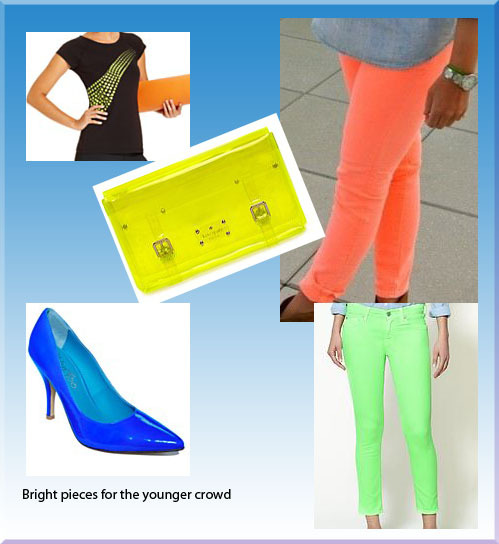 I think you can pull off this look if you are young and pair the bright pieces with neutral colors. Schools are back in session and summer is almost over. Many of the neon pieces featured in this blog are on sale. I found a lot of these pieces on Piperlime.com. If you are interested in this trend, now is the time to shop but I think some of these colors are a little too bright for the fall. You can always start with a small bright accessory such as a watch or belt. Almost anyone can pull off bright pieces in their workout clothing any time of the year. 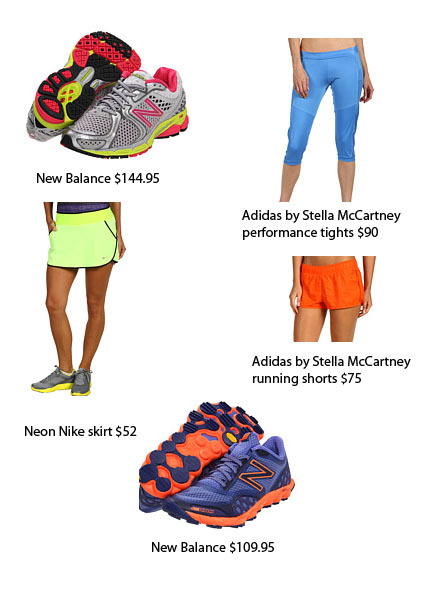 Add a bright-colored sports bra or neon running shoes. As an added bonus bright colors are good visible pieces for outdoor runners. There are plenty of tops and shorts available with pops of neon. I found some fun pieces at zappos.com. Including Stella McCartney’s collection for Adidas. Last month I bought a neon sports bra and a running skirt with a pop of neon at Kohls.